Pet Wash Enclosure with Removable Shelf Dogs title as Mans Best Friend has been around for almost 15,000 years. Currently, dogs are genuinely being treated like mans equal counterpart with their own specific clothes, yummy treats and even doggie hotels. Every dog-owner knows the energy consuming fiasco required with washing these furry pals in our kitchen sinks and bathtubs, along with the mess afterwards. For this reason, we have developed the Home Pet Spa that will not only make our life easier but your dogs more enjoyable. Easy to store in your garage, basement or laundry room, you can now keep your dog clean in the comfort of your own home without worrying about the groomer or the cleanliness of your home. Our unique design offers your dog a relaxing experience in our special dog wash with its strategically positioned jets and massagers, while you give your soapy furry friend the bath he needs with little effort. 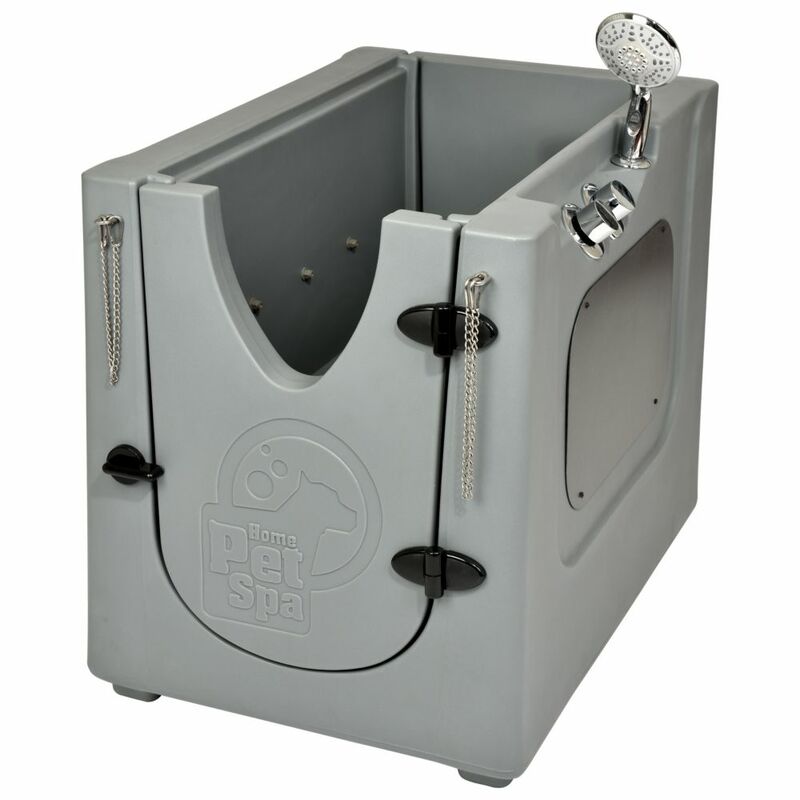 Pet Wash Enclosure with Removable Shelf is rated 4.5 out of 5 by 2. Rated 4 out of 5 by Melinda from Love this item, only issues.No instructions on how to assemble... Love this item, only issues.No instructions on how to assemble the drain piece, and one of the inside hoses was disconnected, so, water was leaking all over the bottom, until I figured out the problem. Rated 5 out of 5 by DaBiMinPinOhio from We love this tub! Our Dachshund/Bichon/ MinPin mix loves to take showers in the wash. She is sm... We love this tub! Our Dachshund/Bichon/ MinPin mix loves to take showers in the wash. She is small so we have to use the shelf, but its perfect to wash off all the dirt she brings in from outside.